These lamps are so much nicer than I expected! The glass base is unusual, classic with a bit of whimsical. Couldn’t be happier with this purchase. Safavieh Lighting 30" Bentlee Table Lamp - Grey - 15" x 15" x 30"
Inspired by sea glass and the romantic notion of messages in bottles, the Bottle Glass table lamp by Safavieh is ideal for coastal and transitional rooms. 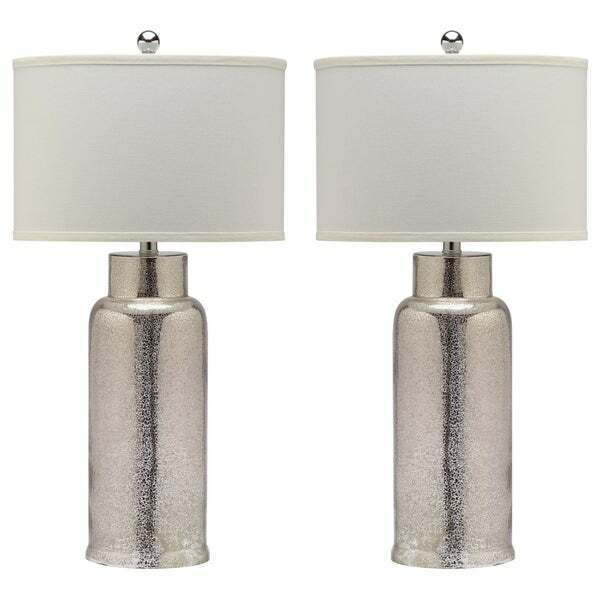 Crafted of antique silver mercury glass, this pretty set of lamps features off-white drum shades. Dimensions 29 in. H. x 15 in. W. x 15 in D.
Absolutely love these lamps! Very easy and quick to assemble. Neutral enough to go anywhere. We are using them in out living room. sitting on dark wood end tables. Came with LED bulbs as well. Lovely , elegant lamps. I'm very happy with them. They really add the perfect lighting to the room. beautiful lamps! easy to put together! well, packaged! and came very fast.they look stunning in my room! We needed something with silver but almost gold fleks and this is it! Lamps had some black liquid inside and when I tried to remove it took off all of the flake inside. Completely ruined lamps on arrival. In the garbage. CHEAP lamps--do NOT buy these. Beautiful. More translucent than I thought but I like them. They are hollow (no bottom) but the bottom has a rubberized cover which is nice and helps keep it in place. I love them. Stylish! Love the accent it adds to the room! Would purchase more if room were bigger! "Where exactly does the cord exit these lamps? On the side or underneath? I don't love the open base and i'm wondering if i can place it on a circular pedestal stand without a cord underneath.."
The cord will exit at the bottom of the lamp. These will look great with our new spare bedroom bed set. I wanted something more modern. Safavieh Lighting Melina Table Lamp 28.5 Inch - Grey / White - 16" x 16" x 28.5"
Safavieh Lighting 19-inch Danaris Table Lamp - Silver - 10" x 10" x 19"